Black holes, resident in the centers of galaxies, will be fed by accretion of ambient gas whenever gas reaches those central regions. This can be due to mergers, but even without mergers the evolution of the stellar populations of normal galaxies provides very large amounts of gas, as stars pass through the planetary nebula stage, the total mass release being greater than 1011 Msolar for massive ellipticals. 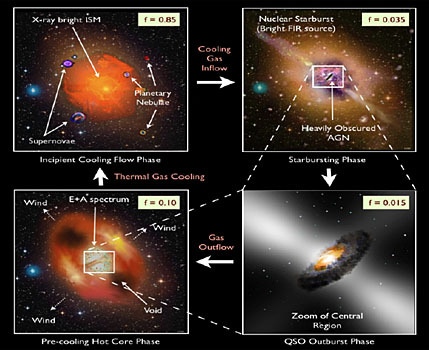 Much of that gas will cool and fall to the centers of the systems, where it will induce starbursts and accretion events onto the central black holes with resultant AGN outbursts. The mass, momentum and energy in these outbursts can have dramatic consequences for the growth of the BH and for the ambient galaxy. Most AGN feedback treatments do not include the mass and momentum components. We follow these events with 1D, 2D and 3D hydrodynamic codes. BH growth is similar to what has been found by others, but the momentum driving produces much more energetic winds than does thermal feedback reducing star formation and thermal X-ray emission. Observable consequences include the narrow line AGN absorption lines, shock accelerated synchrotron emitting particles and wind driven bubbles in the IGM. In addition, we find that the feedback strongly inhibits inflow, causing episodic accretion and a low “duty cycle”. The simulations help us to understand many phenomena including the black hole stellar mass relation, “quenching” of the mass growth, the X-Ray luminosity of ellipticals, the incidence of the “E+A” phenomena and the observed fact that most of the black holes found in galactic centers are found in the “off” state. Recent years have been marked by a notable change in the star formation paradigm. Instead of quasi-static molecular clouds slowly evolving under the influence of gravity and ambipolar diffusion a new picture with more action and dynamics emerged. Within new understanding of interstellar processes, the molecular clouds are associated with turbulent density fluctuations and the structure of the interstellar medium evolves fast on the sound crossing times. 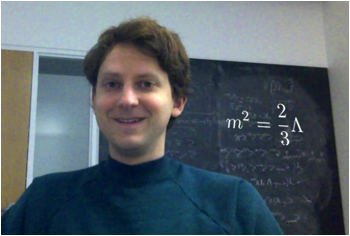 I appeal to the advances in understanding of magnetic reconnection in turbulent medium and demonstrate that fast reconnection can cause of the efficient magnetic field diffusion that does not depend on the degree of media ionization. I shall show that a process that I term "reconnection diffusion" can be responsible for efficient removing magnetic flux during star formation. For the giant molecular clouds (GMCs) and for many cloud cores the resulting rates of magnetic field removal dominate the ambipolar diffusion rates in partially ionized gas. I shall show that numerical simulations validate the concept of "reconnection diffusion" and that this process can successfully explain the existing observational data on magnetic field -- density correlations in diffuse media, removal of magnetic fields from clouds and accretion disks on the time scale less than the ambipolar diffusion as well as the recent results by Crutcher et al. on the magnetization of cores and envelops. I shall discuss the implications of the reconnection diffusion process for the theory of star formation. I will discuss consistency tests of the standard LCDM paradigm in light of the comparison between recent Planck CMB results and local measurements, using alternative models as foils. The proximity of the center of our Galaxy has presented us with a unique opportunity to study a galactic nucleus with orders of magnitude higher spatial resolution than can be brought to bear on any other galaxy. This advantage, along with the recent advances in high angular resolution imaging technologies, has allowed the first observations of individual stars at the very heart of a galaxy. After more than a decade, such observations have transformed the case for a supermassive black hole at the Galactic center from a possibility to a certainty, thanks to measurements of individual stellar orbits. The rapidity with which these stars move on small-scale orbits indicates that 4 million times the mass of the sun resides within a region comparable to the size of our solar system and provides the best evidence yet that supermassive black holes, which confront and challenge our knowledge of fundamental physics, do exist in the Universe. Subsequent high-resolution imaging studies of the Galactic center have shown that the stellar population near our Galaxy's supermassive back hole is quite different from the predications of theoretical models for the interaction between central black holes and their environs (an essential input into models for the growth of nuclear black holes). In particularly, the observations have revealed an abundance of young stars in a region that is inhospitable to star formation and, conversely, a dearth of old stars where as a stellar cusp is expected. Further improvements in measurement precision should enable tests of Einstein's theory of General Relativity in the extreme environment near a supermassive black hole. One of the main avenues for understanding the formation and evolution of galaxies is through studying their present day stellar populations. 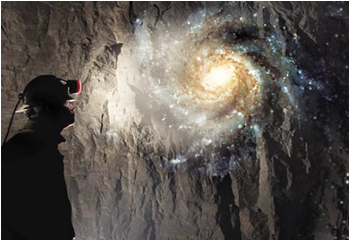 A new generation of population synthesis tools that we have been developing are now capable of extracting an unprecedented amount of information from high quality spectra of galaxies. In this talk I will present results from an ongoing program aimed at measuring the stellar initial mass function and detailed elemental abundance patterns of early-type galaxies over the interval 0 < z < 1. Current data suggest that the IMF varies systematically across the galaxy population, with implications both for star formation theory and the inferred dark matter content in the central regions of galaxies. Constraints on the abundances of the alpha elements, iron peak elements, and neutron capture elements offer the promise of reconstructing the detailed star formation histories of these now dormant galaxies. Measuring the evolution of these quantities through cosmic time will provide new constraints on the assembly histories of galaxies and will open up a new era of 'extragalactic chemical tagging'. Collapsing stellar cores and the early universe are fantastic engines for generating neutrinos, ghostlike particles which interact with matter only through the aptly named weak interaction and gravitation. However, neutrinos can more than make up for these feeble interactions with huge numbers. They can even come to dominate the energetics and element synthesis in the early universe and supernovae. But the way neutrinos interact with matter depends on which of three "flavors" they come in, i.e., electron, muon, or tau flavor. We therefore must determine how neutrino flavor changes as these particles move through their surroundings. This is a tricky, new kind of quantum mechanics problem. 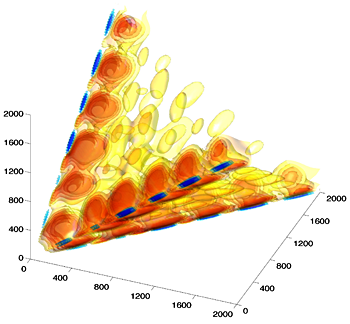 The advent of supercomputers has allowed us to follow this process in places, like supernova cores, where the flavor states of the neutrinos determine how flavor changes. And yes, this process is fiercely nonlinear. The results are startling and unexpected. Neutrinos can undergo collective flavor oscillations, producing signatures akin to domain formation in familiar condensed systems like ferromagnets. These signatures, if detected, could give us insights into astrophysical processes, like where the elements come from, but also into as yet unmeasured fundamental particle physics and cosmology issues, e.g., the neutrino mass hierarchy, the neutrino magnetic moment, and dark matter. Future high precision measurements, especially of the cosmic background radiation, promise to box-in many currently outstanding issues in neutrino physics. Cosmology is now entering one of its most scientifically exciting phases. Decades of surveying the sky have culminated in the celebrated "Cosmological Standard Model". Yet, two of its key pillars, dark matter and dark energy -- together accounting for 95% of the mass-energy of the Universe -- remain mysterious. Deep fundamental questions demand answers: What is dark matter made of? Why is the Universe's expansion rate accelerating? Should general relativity be modified? What is the nature of primordial fluctuations? What is the exact geometry of the Universe? 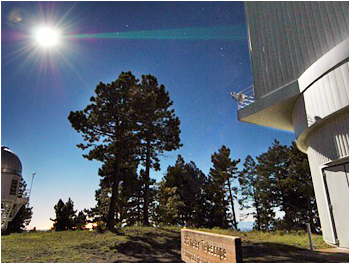 Next-generation observatories will open new routes to understand the true nature of the "Dark Universe". These observations will pose tremendous challenges on many fronts -- from the sheer size of the data that will be collected (more than a hundred Petabytes) to its modeling and interpretation. 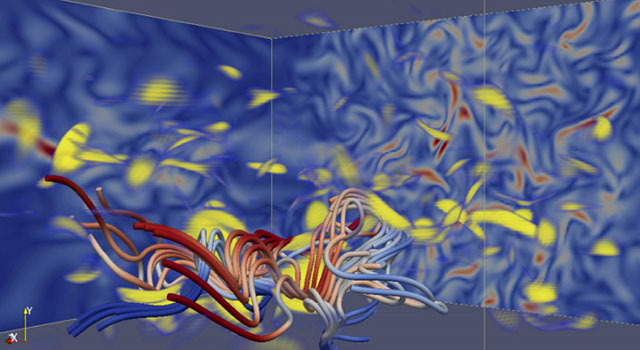 The interpretation of the data requires sophisticated simulations on the world's largest supercomputers. 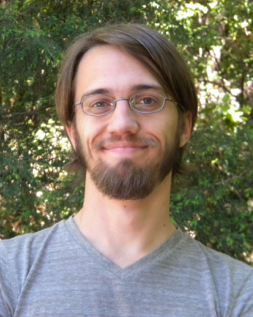 The cost of these simulations, the large number of modeling parameters, the uncertainties in our modeling abilities, and the fact that we have only one Universe that we can observe opposed to carrying out controlled experiments, all come together to create a major test for the process of scientific inference. In this talk I will give a very brief introduction to the Dark Universe and outline the challenges ahead. To combat these challenges, close cross-disciplinary collaborations between physicists, statisticians, and computer scientists will be crucial. I will discuss two key advances brought about by successful collaboration: (i) the development of HACC, a new N-body code that enables us to carry out very large cosmological simulations, and (ii) the cosmic calibration framework which melds sophisticated statistical methods with simulation and modeling inputs to attack the problem of scientific inference. Laser range measurements between the earth and the moon have provided some of our best tests to date of general relativity and gravitational phenomenology--including the equivalence principle, the time-rate-of-change of the gravitational constant, the inverse square law, and gravitomagnetism. APOLLO (the Apache Point Observatory Lunar Laser-ranging Operation) is now collecting measurements at the unprecedented precision of one millimeter, which will produce order-of-magnitude improvements in a variety of gravitational tests. Experimental performance, evidence for dust-induced degradation of the reflectors, finding the lost Soviet Lunokhod 1 reflector, project status and science outlook will be discussed. Several giant planets have now been directly imaged, offering the first view of extrasolar planets at wide separations from their host stars. Formation of these objects by either leading theory--core accretion or gravitational instability--presents substantial difficulties. These challenges may be reinterpreted as opportunities. In this talk, I will demonstrate how to use upcoming constraints from direct imaging to distinguish between theories of giant planet formation. Along the way, I will discuss whether gravitational instability could have formed the iconic directly-imaged planetary system HR 8799, present a new theory of planetary core growth in the presence of gas that extends the reach of core accretion to large stellocentric distances, and show how the atmospheric compositions of giant planets record signatures of their formation locations. Cosmological hydro simulations can give unique insight into the formation and evolution of galaxies and their interplay with the intergalactic medium. They have realistic initial conditions, they can provide representative samples of galaxies that span a wide range of mass and environment, they can follow their evolution over time, and they can simultaneously model both the galaxies the intergalactic medium around them. The drawback of cosmological simulations is, however, their limited resolution and the importance of subgrid models. I will give an overview of the ingredients of the simulations and discuss recent developments, current issues and bottlenecks. I will then use the simulations to highlight the key role that self-regulation plays in the evolution of galaxies. Finally, I will demonstrate that the feedback processes that appear to be needed to match the observations have a dramatic impact on observational cosmology. The Baryon acoustic OScillations Survey in SDSS-III is obtaining more than one hundred thousand absorption spectra of quasars at redshift z>2. This opens a new window for studies of large-scale structure at high redshift, which has already resulted in the first detection of the Baryon Acoustic Oscillation peak at these redshifts, using absorption of intergalactic gas. Cross-correlations of the Lyman alpha absorption with other objects, among them Damped Lyman Alpha absorption systems as tracers of high-redshift galaxies, reveals their spatial distribution and provides new clues on how galaxies were forming at this epoch, when the universe was about 3 billion years old. Image: Contours of the redshift-space cross-correlation of damped Lyman alpha systems with the Lyman alpha forest absorption, comparing the observation (left) with the linear theory prediction (right). After COBE and WMAP, the recent results from Planck probe the primordial signals with unprecedented precision. For the very first time, the Planck mission detects the ISW-lensing bispectrum which comes from the non-linear evolution of the CMB. We have entered an era when the linear perturbation theory is simply not enough. 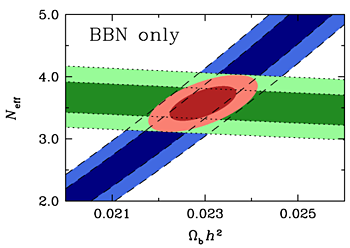 While most dominant effects on the CMB are studied through the Boltzmann equation, some late-time effects including the weak lensing effect are calculated differently. As a consistency check, we establish a rigorous framework where we can study different effects on the same pace. In this talk, I will present the formalism of calculating the weak lensing effect by directly solving the Boltzmann equations. The formalism can be extended to arbitrary orders in the perturbation theory and facilitates the studies of non-linear effects. Similar techniques can be used to calculate other late-time effects (e.g. the Rees-Sciama and time-delay effect) and all the possible couplings among them. I will also demonstrate how to use a set of diagrams to simplify the calculations in high orders. We are currently in an exciting era of precision cosmology. With the release of the cosmic microwave background data recorded by the Planck satellite, we are now in a position to accurately test the standard model of cosmology and particle physics. In this talk, I will present two new, precise measures of the primordial abundance of deuterium - the most accurate measurements to date - derived from redshift ~3 metal-poor damped Lyman-alpha systems. In light of these new measurements, we have performed a careful reanalysis of the best literature systems where the primordial deuterium abundance can be estimated. These precise measures, when analyzed in conjunction with the Planck data, now place strong limits on the effective number of neutrino species in the early Universe, and offers new insight into physics beyond the standard model. I will also discuss our ongoing survey to obtain new precision measures of the primordial deuterium abundance. What can Galaxy Evolution tell us about Short Gamma-Ray Bursts? 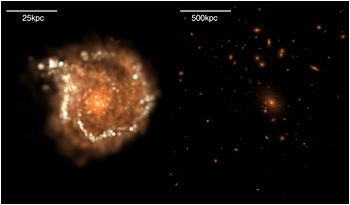 We use recent constraints on the star formation rate---halo mass---redshift relation to model the host halo environments where short Gamma-Ray Burst (sGRB) progenitors are created. 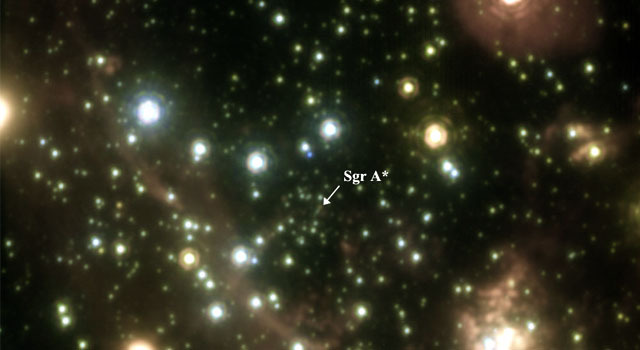 These halo environments set minimum energy requirements for sGRB progenitors to leave the vicinity of their original galaxy. 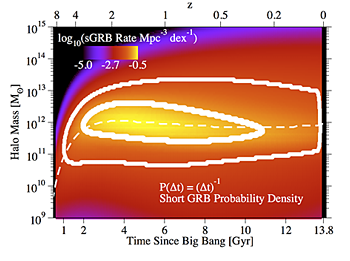 We find that the fraction of sGRBs which are hostless is a robust probe of the underlying velocity kick distribution for sGRB progenitors, regardless of uncertainties in the sGRB time-delay distribution and observational systematics. We use observed constraints on the hostless fraction of sGRBs to rule out several sGRB progenitor classes which cannot supply the necessary velocity kicks. Finally, we discuss the ability of sGRB galaxy host properties (e.g., stellar mass and morphology) to further constrain model uncertainties. Galaxy formation is a complicated process that is notoriously hard to model due to both the large variety of physical phenomena that are involved and the huge dynamic range that they encompass. I will present recent results from the Illustris project, which is a set of large cosmological hydrodynamical simulations, including the largest ever performed. The simulations are run with the moving-mesh code Arepo, and include physical processes critical for galaxy formation, such as various forms of stellar and AGN feedback. In many critical respects, the simulated galaxy populations that are obtained resemble the galaxy populations observed in the real Universe. I will discuss various aspects of the galaxy formation process as it appears in these simulations. The Holometer is an experiment designed to test a proposed theoretical model attempting to merge physics at gravitational and quantum mechanical scales. It consists of two 40m Michelson interferometers independently sampling their beamsplitter positions in search of a resulting Planck-suppressed fluctuation in the position measurements. Co-located instruments will show this noise as a correlated signal below the optical shot-noise in the instruments' sensitive band from 100kHz-10MHz. This talk will provide an update on the Holometer operational status, including an overview of ongoing commissioning efforts and current sensitivities. On de Sitter space, there exists a special value for the mass of a graviton for which the linear theory propagates 4 rather than 5 degrees of freedom. If a fully non-linear version of the theory exists and can be coupled to known matter, it would have interesting properties and could solve the cosmological constant problem. I will describe evidence for and obstructions to the existence of such a theory. One of the best-motivated classes of dark-matter candidate is the Weakly-Interacting Massive Particle (WIMP). 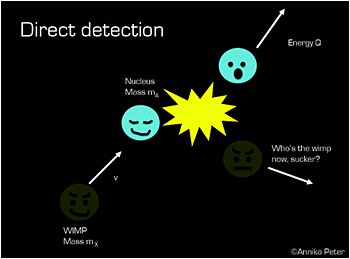 In this talk, I will discuss WIMPs in the context of direct-detection experiments. First, I will discuss a new signal for WIMP dark matter: gravitational focusing in direct-detection experiments. This effect leads to an energy-dependent phase-shift in the peak direct-detection event rate throughout the year. I will discuss this in light of current putative annual-modulation claims. Second, I will discuss what we can learn about WIMPs in the "early-discovery" days once WIMPs are conclusively found in direct-detection experiments. I will show that what we can learn about WIMPs depends sensitively on the ensemble of experiments that are running at the time of discovery. The mysterious nature of dark matter has eluded explanation for decades, and remains a major puzzle in physics today. Detectors that search for the direct interaction of dark matter with target nuclei must distinguish rare dark matter interactions from abundant backgrounds that can masquerade as signal. Searches for dark matter have not yet fully exploited a unique astrophysical signature of dark matter: the angular distribution on the sky. No known background can mimic the expected forward-backward asymmetry of WIMP-induced interactions. I will give an overview of directional dark matter detection, and describe recent experimental results. CMB Lensing is a probe of the matter distribution between the surface of last scattering and today, which has been measured using CMB temperature data. Signal to noise for lensing reconstruction from CMB polarisation data is expected to be much better, since B modes on small scales should vanish in the absence of lensing. An effect of having data from an incomplete sky is leakage of E mode power in to B mode power. Upcoming data analysis from ground based CMB polarisation instruments must account for this effect. In the first part of my talk I will show forecasts for CMB polarisation lensing reconstruction from small patches of sky, which incorporate the pure B mode estimator to clean up the E-B leakage problem. CMB lensing is also well correlated with the galaxy distribution, indeed CMB lensing was first detected via cross correlation with a radio survey. In the second part of my talk I will show results on cosmology (neutrino mass sum and tau parameters) and astrophysics (bias and redshift distribution parameters) from the joint analysis of CMB lensing and the 2D galaxy power spectrum. It remains to be seen what can be learned about cosmology and astrophysics from this correlation, and our forecasts begin to quantify this. Large-scale structure (LSS) surveys have produced powerful probes of various cosmological phenomena, including inflation, reionization, and the accelerated expansion epoch. Current and upcoming LSS surveys will allow us to answer several fundamental questions about our Universe, but systematic effects are of great concern to these missions. We present our latest results considering systematic effects in upcoming LSS surveys. We show that photometric calibration errors contaminate photometric surveys on large scales, which biases measurements of non-Gaussianity, and present methods to mitigate their effects. We also discuss the contamination of emission-line surveys and dark energy measurements by interlopers, as well as potential methods to remove the contaminating emission lines. Finally we discuss "intensity mapping", a new LSS survey strategy where we map fluctuations in the intensity signal from star-forming galaxies and the intergalactic medium in order to probe LSS and reionization. The distribution of dark matter in our Galaxy is an important constraint on theories of dark matter and structure formation, yet currently is very poorly understood. The Gaia astrometric space mission, which launches this winter, will make huge strides in understanding the distribution of mass in our Galaxy by precisely measuring the six-dimensional phase space positions of 150 million stars. In this talk I show how Gaia observations of stars in the tidal streams of the accreted Galactic halo can be used to infer the halo's total gravitational potential, by exploiting the natural clustering of stream stars in action space. Tests with a spherical mock halo show that for a Gaia-like selection function and error model, the number of streams we expect to find in the accreted halo is well above the number needed to determine the two parameters of this toy potential. I will discuss the expansion of the technique to more realistic models of the potential, and the prospects given improvements in data quality from complementary ground-based surveys like LSST and WEAVE. Infrared photometric surveys are now discovering quasars at z > 6.5, enabling investigation of neutral Hydrogen and its associated heavy elements at the tail end of the reionization epoch. I will discuss results from our earliest spectroscopic observations of these objects using FIRE on Magellan, and frame these results in the context of early circumgalactic metal pollution. Finally, I will discuss limitations of the current measurements and ways that next-generation telescopes may help address these shortcomings.